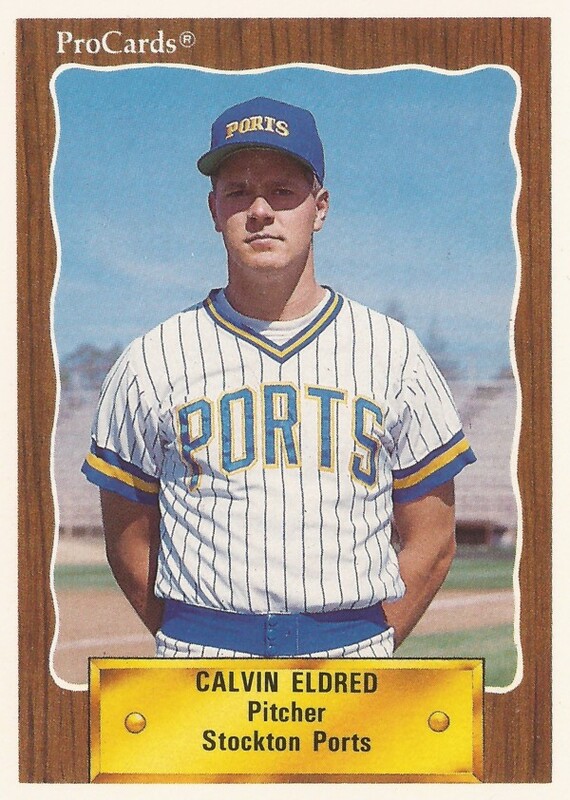 In his 10th major league season, Cal Eldred had already suffered through hard luck and injuries. But he had stretches of brilliance. In 2000, pitching for the White Sox, Eldred was in a stretch a brilliance. "You learn to be patient, you learn it's a process. It really still makes me realize I need to go day by day," Eldred told reporters that June. "It really feels good to be back out being competitive and helping the team." Eldred went on to a 10-2 season that year, with a 4.58 ERA. He would also pitch through more injuries, finding himself in 2004 pitching in the World Series with the Cardinals. 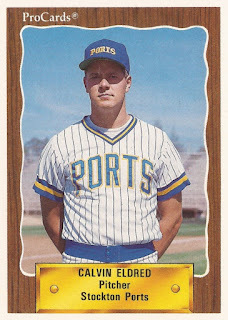 Eldred's career began in 1989, taken by the Brewers in the first round of the draft out of the University of Iowa. He made high-A Stockton and AA El Paso in 1990, then AAA Denver and Milwaukee in 1991. Eldred debuted for the Brewers late that September. He started three games, going 2-0. He won his debut by a score of 5 to 4. "I'm glad it's over and glad it came out the way it did," Eldred told The Milwaukee Journal afterward. "I struggled a few times. I think the adrenaline got the best of me." After his call up the next year, it seemed like any struggles Eldred had were behind him. Hitting Milwaukee in July, Eldred went 1-1 in his first three starts. Eldred then rattled off 10 straight wins. At one point, his ERA was a paltry 1.26. "I'm not worried about my ERA," Eldred told The Milwaukee Sentinel that September. "I just want to help the team win. It will be more gratifying in the off-season. I don't want to think about it now. I've got to keep pushing." Eldred finished the year 10-2 with an ERA of 1.79. He also finished fourth in the Rookie of the Year balloting. In 1993, Eldred won even more. He won 16 games. He also lost 16. That April, Eldred set down 23 straight batters and gave up just one hit. He was also pulled in the ninth, he'd thrown 121 pitches. Eldred went 11-11 for the Brewers in 1994. Then came 1995. He got four starts, then came elbow troubles that prompted surgery. He didn't return until mid-1996. He got his first win back in July against the Yankees. He went 4-4 that year and returned to form in 1997, going 13-15. Going into 1998, Eldred went over what he learned over those injury-shortened seasons, speaking with The Milwaukee Journal-Sentinel. "Not to be in a hurry, that's one thing," Eldred told The Journal-Sentinel of what he'd learned. "Things go fast enough. Pay attention to how you feel. I probably appreciate things a little more. When you come from a point where everything could have been taken away from you, all this other stuff doesn't seem so bad." Eldred went 4-8 that year and 2-8 the next. In January 2000, the Brewers traded Eldred to the White Sox. Eldred quickly showed the White Sox the Eldred of old. In late April, Eldred struck out 11. He gave up a leadoff double, then set down 26 of the next 27 batters, The Chicago Tribune wrote. Eldred ended the season 10-2 with a 4.58 ERA. But it was also another injury-shortened campaign. He had a screw put into his elbow that August. The next April, the pains returned, The Tribune wrote. Eldred got into only two games that season and didn't play again until 2003. In spring 2003, Eldred was with the Cardinals. He even made a bid for a starter's spot. "It's all about health with him," Cardinals Manager Tony LaRussa told The Associated Press of Eldred. "If he's healthy, he'll be a very good pitcher." Eldred made the team, but as a reliever. In 62 appearances, Eldred posted a 3.74 ERA. He returned in 2004 and 2005. In 2004, Eldred pitched in another 52 games, with a 3.76 ERA. He also played in his first post-season, getting two appearances in the World Series against the Red Sox. Eldred retired after a 2005 season where he appeared in 31 games and posted an ERA of 2.19. "He's just at a point where he's thrilled to have had all of the opportunities he's had and he feels it's time to focus on his family," Eldred's agent Ron Shapiro told The AP of Eldred's decision. "I just think it's a matter of timing. Some people stay longer in this game than they should, and Cal's not going to do that."